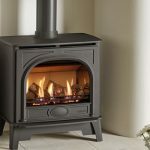 Home » Blog » Posts » Advice & Information » Can I have a stove in a new build? 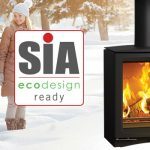 Can I have a wood burning stove in a new build? Yes. It is possible to install a wood burner in a new build. It is likely that your new build home does not have a chimney, but this does not mean you cannot have a wood burning stove as there may be options available to you. If you have a new build or home without a chimney, it is likely that you can have a pre-fabricated flue system installed (such as Stovax Professional XQ). This works in the same way a normal chimney would, and can run either internally or externally to your property. If you still enjoy the look of a conventional chimney, you can choose for your flue pipe to be hidden behind a faux chimney breast. It is important to remember that in airtight properties such as new builds, there must be an air vent permanently open to the outside. The size of the air vent opening is dependent on the heat (kW) output of the appliance in the room. Some wood burning appliances have the option of an Outside Air Kit that ducts the air from outside the house directly to the appliance, without the need for an open vent into the room. Your Stovax retailer will be able to advise in detail and complete a site survey to determine the best options for your home. 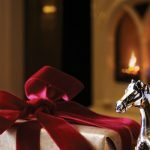 Can I have a gas stove or fire in a new build? Yes. It is possible to install a gas fireplace in a new build. There are many options available here. Whilst a conventional flue gas fireplace requires a chimney, you can have a pre-fabricated flue system installed – just like you would for a solid fuel stove or fire. The same air ventilation rules apply, but your local expert retailer will be able to advise you on what is best for your home, and your Gas Safe installer should ensure this is carried out correctly. Balanced flue gas fires do not require a chimney, making them a good option for a new build property. They work in conjunction with glass-fronted gas stoves or fires, and are completely sealed from the room into which it is installed. This means there are no draughts, and heating efficiency is increased, with a twin-wall pipe venting directly to an outside wall. This also means no additional ventilation is required. You can read more about how a balanced flue gas fire works here. You can make the most of the cavity wall in your new build by having a cavity wall gas fire installed. 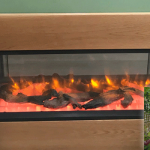 A cavity wall gas fire features all the benefits of a full-depth gas fire but with the added ability to be installed in the internal leaf of a cavity wall. Most of these fires come complete with a dedicated rear exit balanced flue termination kit, which uses a twin-wall pipe to vent directly through the outside wall. Glass-fronted, the fire is completely sealed from the room and the air needed for combustion is drawn from the exterior of the property. Partial cavity wall gas fires work in much the same way as a cavity wall fire. Here, the fire is recessed almost entirely within the internal leaf of the wall, with a small protrusion left to be housed. This reduces the footprint of the fire in the room dramatically, requiring little space. One example from Gazco is the award-winning Riva2 500HL Slimline Gas Fire, which is even available with a stylish Esprit surround to house the extra depth. Can I have an electric fireplace in a new build? Yes. Perhaps the easiest installation of all, an electric log burner does not require anything more than a plug point making it a great option for a new build. 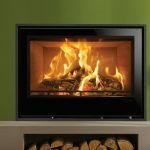 Depending on how involved you want your installation to be, you could opt for simple options such as choosing an electric fire that simply hangs on the wall, like an outset Skope model, or go further and install a faux chimney breast for a freestanding electric stove to sit within for a realistic result. An electric fire is best placed in the middle of the room, away from windows or doors. This allows the maximum efficiency from the heater to circulate the warm air around the environment. Electric fireplaces often come with alternative fuel effects as well, making for an ultra-contemporary installation.